Digital printing is the perfect solution for short run and rush printing projects. If you have a big event and you need full color cards, fliers, stickers, posters, brochures or even presentation folders, don’t panic. 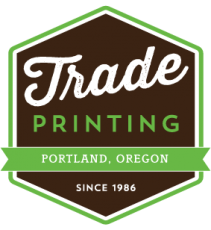 Trade Printing has the capabilities and a well-trained, knowledgeable team to meet your deadlines. Choose from many different stocks and a full range of finishing options including scoring, corner rounding, hole drilling, custom die-cutting and perforating to meet your creative needs. With our experienced production staff overseeing your project, you don’t have to sacrifice quality for speed anymore. Digital print gets you your project as fast as possible. With no drying or set-up time, your mailer or brochure can literally come off the press and into your hands so you can get back to business! With digital printing, if you only need 100 copies of a document we only have to print 100 copies. With traditional offset printing the pressman will need to run hundreds of sheets through the press before the plates get inked up and start printing quality sheets. With digital printing, you can accurately proof your jobs in an instant. Spend more time worrying about your work than your print with quick and accurate digital proofing. If its a personlized print solution that’s required, our variable data capabilities are there to meet your needs. Just send us an excel spreadsheet along with your art files and we’ll do the rest!